"Play it nice and cool son, nice and cool..."
Here is one of the funniest moments from the classic Only Fools and Horses comedy series - you know you want to see it just one more time! By the way, you may need to turn your brightness up as the clip is a little on the dark side. Unfortunately, it's the only official clip available. The episode was originally broadcast on 8 January 1989, and was the first episode of series six entitled "Yuppy Love". Considering this was the sixth series, this scene goes to prove that the writer, John Sullivan, had certainly not run out of ideas. Del Boy (David Jason) and Trigger (Roger Lloyd-Pack) spot two young ladies sat at a table in the local bistro who are eyeing them up and down. Looking like the cat who's got the cream and with a massive grin on his face, Del Boy says to Trigger "I think we're on a winner here Trig, alright" -as soon as he comes out with a line like that you just know it's going to end in tears! In the meantime, the barmaid opens the flap to the bar and walks through, which Del fails to notice. Then comes the classic line "Play it nice and cool son, nice and cool, you know what I mean". Que a comedy gold moment when Del goes to lean on the bar and falls straight through! Now, there are several elements that make this scene so funny. Firstly, the fact that David Jason keeps his body perfectly straight while falling - that must've taken quite a number of takes to get right! Then there is the fact that Trigger isn't paying attention to him, which leads to a brilliant double-take reaction by Trigger, which is priceless. Also, when a dishevelled Del finally gets up off the floor, he is still holding his glass of wine - pure genius! It's not hard to see why this scene and the "Yuppy Love" episode have been voted the best ever by fans on several occasions. Of course, without the superb acting skills of both Jason and Lloyd-Pack, the scene wouldn't have been half as funny, and they manage to squeeze out many extra laughs just from being such brilliantly funny characters. 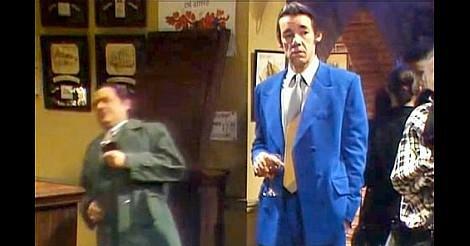 Del Boy trying to act like the cool guy is always funny and Roger Lloyd-Pack had a face just made for comedy, too - R.I.P. I did notice a couple of comments from younger people on Youtube stating "I didn't laugh". I think the problem here is that the video is titled "Dell falls through the bar". At the time (I was 21 in 1989), we really didn't know what was about to happen, so by telling the viewer what's going to happen before they've watched it, the surprise element has been completely eliminated. Having said that, I still find the scene hilarious even after watching it for about the 20th time, so maybe they're just miserable sods!